At a tiny garage off the Via Appia in Rome, Pietro, an elderly mechanic was hanging up a "chiuso per lutto" (closed for mourning) sign. "I share the same birthday as Giovanni Agnelli and I've spent half my life under cars he's made, so it's the least I can do," he said disconsolately. In the bar across the road Juventus supporters pondered the future of their club without the man who has been its owner and passionate fan for half a century. At the hairdressers next door clients discussed the tragedies that have plagued Italy's most famous and glamorous family. 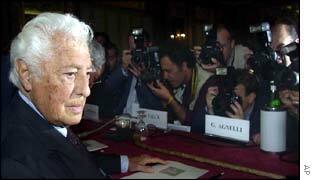 The news of Giovanni Agnelli's death has touched ordinary people across Italy and television has dedicated much of the day's programming to the news. Politicians of every hue, intellectuals, editors, industrialists and sportsmen have paid tribute to the man known simply as L' Avvocato - the lawyer. Even the Pope sent a telegram of condolence for the passing of "a very influential figure at important moments of Italian history". President Carlo Azeglio Ciampi said the 81 year old industrialist had "reflected the fundamental values of the national identity and character". For Prime Minister Silvio Berlusconi, Agnelli was "a master of style". Marcello Pera, the speaker of the Italian senate, mourned the loss of a "great statesman", while EU Competition Commissioner Mario Monti recalled "a powerful and charismatic person, but at the same time close to the people". Turin, the northern industrial city so closely tied to Agnelli empire, will shut down to mourn tomorrow. "He had a strong symbolic value for our city, for better or for worse, in good times and bad," said left-wing Mayor Sergio Chiamparino. "It feels as if we have lost our compass," said a local tourist board employee, "and somehow a part of Turin has disappeared with Agnelli". Flags hung at half mast at Fiat factories and showrooms; work stoppages at two of the major plants were called off. "He was a remarkable man and it will be hard to replace him. I just wish he had not seen his empire plunge into disaster," said a worker clocking off at the Mirafiori plant. Ferrari chief Luca Cordero de Montezemolo, once viewed as crown prince to the regal Mr Agnelli, said his passing had left an "unfillable vacuum". The range of comments reflects the breadth of interests of the man who was not just a car mogul but an intellectual, an art lover and a sportsman. Carlo Rossella, ex-editor of the La Stampa newspaper, controlled by the Agnelli's, said Giovanni would often call him to talk about international affairs and culture, though "never did he try to influence my editorial line". "He was a man who had known immense suffering and shown great courage", said veteran commentator Enzo Biagi, referring to the early loss of Mr Agnelli's parents, and the recent tragic deaths of his nephew and son. Even his fiercest critics - trade unionists and far left wing parties - acknowledged the passing of an extraordinary man. "He was the symbol of an era. He was a moderniser and before anyone else he fought to pull Italy out of its provincialism," said Pietro La Rizza, former head of the UIL trade union federation. There will be a minute of silence at all Serie A and B football matches this weekend for the man who has always followed "his" Juventus with passion and respect. Mr Agnelli will be laid in state at Fiat's original factory, Lingotto, at the art gallery which houses part of his private collection of paintings, recently donated to the city. "Fiat's future looks more uncertain than ever"
"He has been a leading figure in terms of cultural and industrial matters"